Remember when Mom told you not to eat raw cookie dough because it would make you sick? You can throw that rule out the window with these cookies! This dough is made to be eaten! Growing up, I used to make cookies from scratch with my Mom. A memory that has stuck with me through the years. I know I wasn't supposed to try the dough because the raw egg could make me sick. But I couldn't resist! The dough was my favorite part of the cookie. I would sample a cookie or two after they were baked, but really I just loved the dough. Now you can make cookies without the hazard of raw eggs. Actually you don't even have to bake the cookies. These are all about the dough! I found this recipe on Family.com. I think it is easily my new favorite. Plus they are so easy and fun to make with the kids. Sampling the dough is encouraged! Cream butter and sugar together. Add vanilla and flour, mix well. Fold in your chocolate chips. 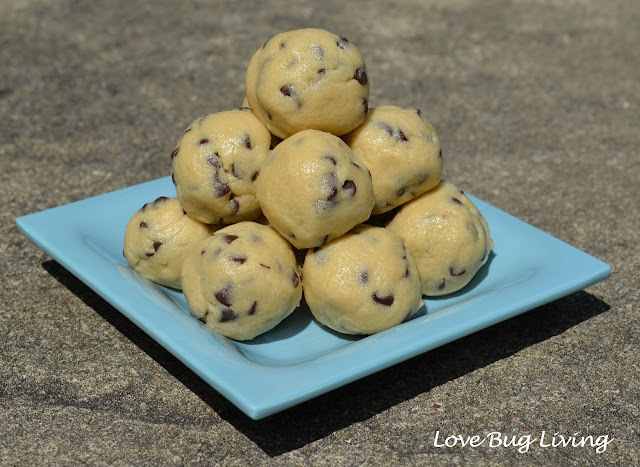 Roll into 1 inch balls (or go ahead and just eat your dough with a spoon!) Refrigerate until firm, about 30 minutes. Let stand a few minutes before serving. Store in the refrigerator. Makes about 2 dozen cookies. I was out of brown sugar, so I substituted 1.5 cups of white sugar mixed with 1.5 Tablespoons of molasses. I also am going to be experimenting with other mix ins. 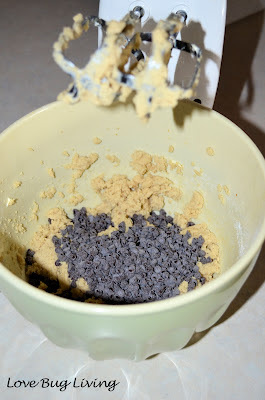 Feel free to substitute your favorite cookie ingredients like mini M&M's, butterscotch chips, crushed oreos, Heath bar bits, sprinkles, or even add some chopped nuts with your chocolate chips. Make your cookie dough bites into truffles by drizzling or even dipping them in chocolate. Roll them into tiny balls and use as an ice cream topping. So many delicious possibilities! Yum!!! Cookie dough is the best! There is always some that never makes it to the oven when I bake cookies:-) This is better since there is no eggs!!! Yay, thanks so much for linking up! 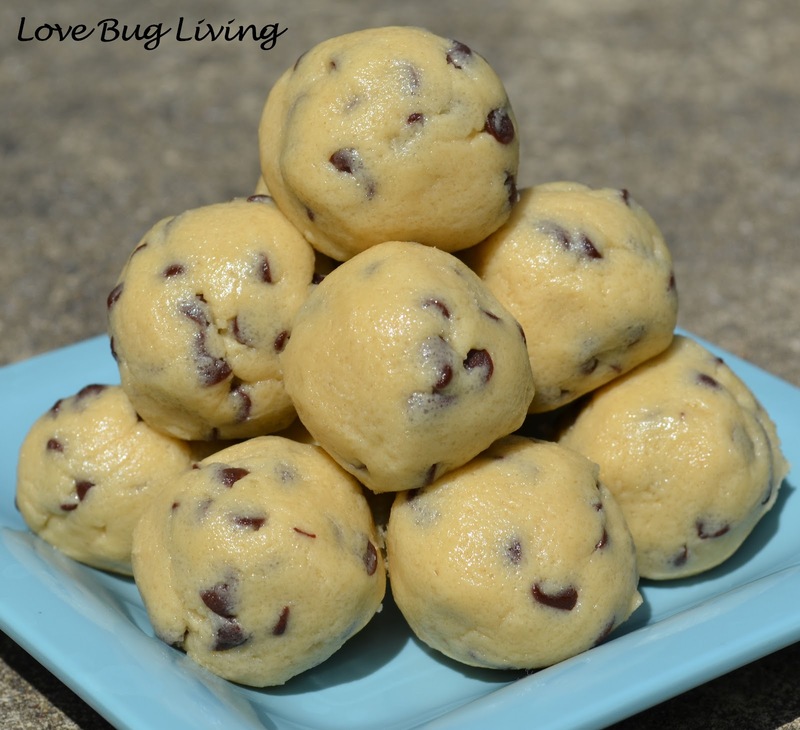 I'm a firm believer that cookie dough should be eaten raw! I’d love for you to link up this (and any other ideas you’d like to share) at "One Creative Weekend" on OneCreativeMommy.com. Yum, yum, yum! I’m so glad you linked this up at One Creative Weekend! I love it! I’d love for you to join the party again tomorrow.